Thanksgiving in October or November? As many of you might not be aware, the this is Canadian Thanksgiving weekend. Our Canadian friends celebrate Thanksgiving on the second Monday in October, but American Thanksgiving is not until the fourth Thursday in November. Without the daring and bravery of men like Commodore Oliver Hazard Perry during the War of 1812, what is now the United States of America could have looked very different. In fact, much of it may be part of Canada… hence celebrating Thanksgiving in October! While there were many battles during the war between the Americans and the British, the battle of Lake Erie is considered one of the most significant naval battles to occur in the War of 1812. Nine vessels of the United States navy defeated six British vessels of the Royal Navy (at the time considered far superior to the American navy). It was the first time in history that an entire British naval squadron surrendered. Not only did this battle enable the Americans to regain control over Detroit, it also paved the way for future victories, forcing the British to retreat up the Thames river where they were ultimately defeated during the Battle of the Thames. These victories ensured that Ohio and Michigan remained part of the United States. Think of how different the United States map would look without these states and how different the economy would be without access to the Great Lakes. We didn’t know much about Commodore Perry or the story of the Battle of Lake Erie until we visited the Erie Maritime Museum in Erie, Pennsylvania. When in port, this museum features the U.S. Brig Niagara, a replica of Commodore Perry’s flagship during the Battle of Lake Erie. The original ship was built here – in fact, all of nine vessels in his fleet were built in this protected port. Along with the U.S. Brig Niagara and some amazing scale models of tall ships, the museum has some really interesting displays that chronicle the history of the Great Lakes and the Battle of Lake Erie. You may have heard the famous quote “Don’t Give Up the Ship”. We had seen that, but didn’t know its origin. We learned that Commander Perry had a battle flag made with just these words and during the Battle of Lake Erie, even when his flagship was severely disabled – he used that flag to reenergize his men and gain victory. He did not give up the ship. Instead, in the midst of battle he took a rowboat to another ship (the Niagara) and hoisted his flag there; charging the enemy and ultimately forcing their surrender. That victory led to another famous quote attributed to Perry – “We have met the enemy and they are ours”. 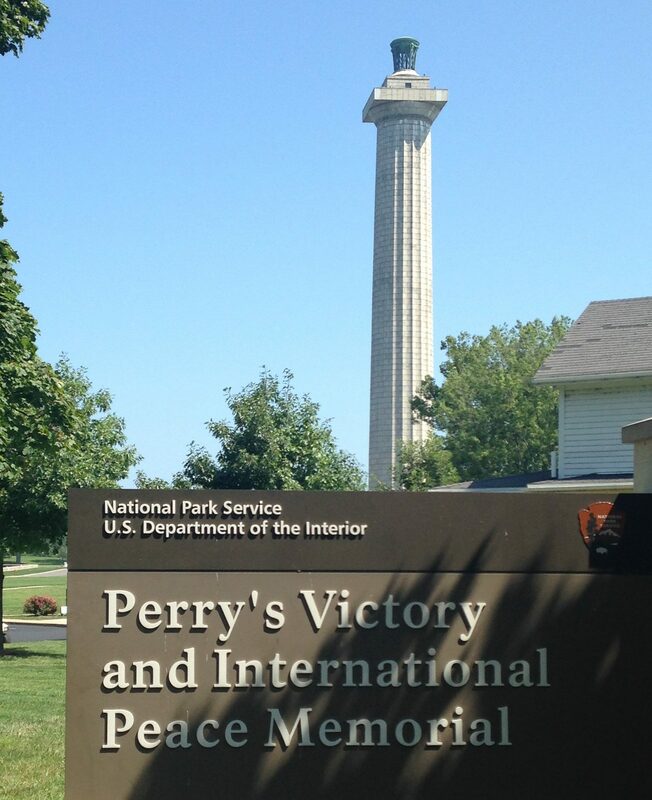 Visiting the naval museum got us more interested in Commodore Perry, so we took the time to visit Perry’s Victory and International Peace Memorial on South Bass Islands in the village of Put-In Bay. The only way to get there is by ferry, but it is worth the side trip. 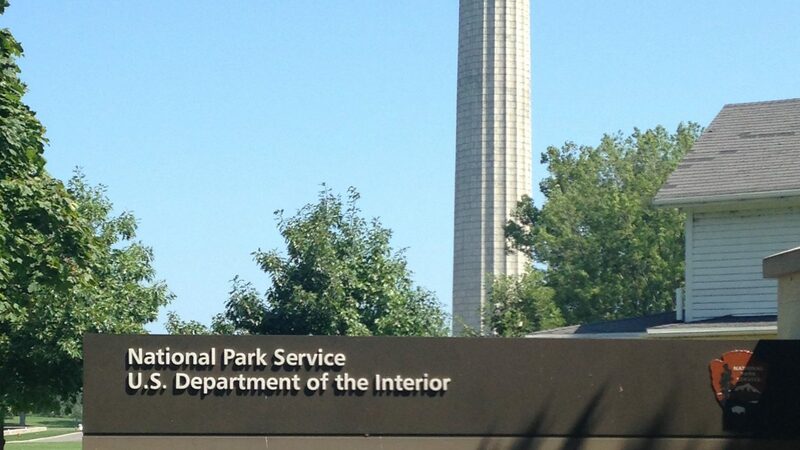 The memorial is a 352 feet tall column; 47 feet taller than the Statue of Liberty! 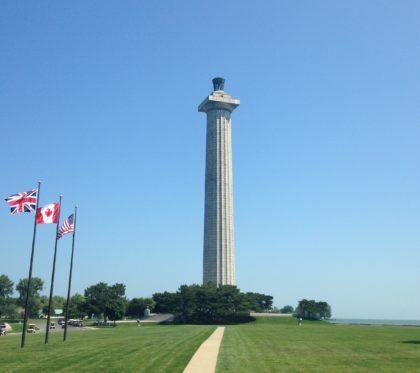 It is the only International Peace Memorial in the National Park system, built to commemorate the Battle of Lake Erie and honor those who fought. But even more, it celebrates the lasting peace between the Great Britain, Canada and the United States. You can go to the very top of the memorial. Climb 37 steps and then take an elevator to the top where you can walk outside and see in every direction. As long as you are okay with heights, it is a gorgeous view. Some of the nearby islands you see are actually in Canada. 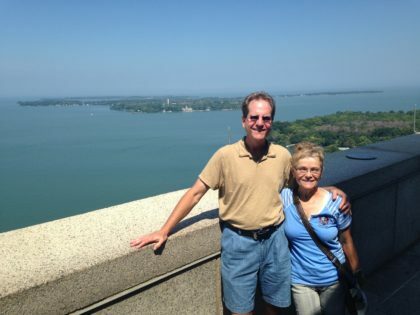 While you are there, be sure to take some time to wander around the village of Put-In-Bay. It is a cute little summer resort area. It made us feel like we were in Key West or some other “Jimmy Buffet” type of town. 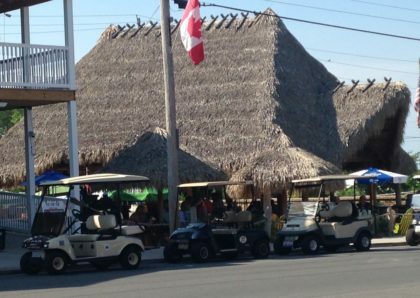 Folks drive around in golf carts and there are lots of little outdoor bars and restaurants. 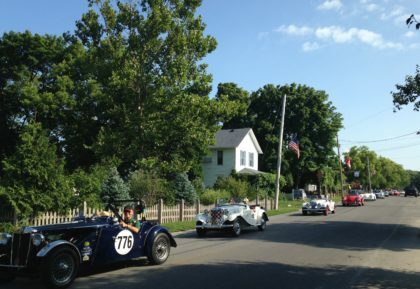 When we were there, it just happened to be on a day that they had their annual vintage car race around the islands. What a hoot! I love this place! Thanks for writing about it. – Great Lakes Brewery in Cleveland named an IPA after Commodore Perry.